It is that time of the year again. Georgia State aims to start their season on the right foot when they host the Atlanta Challenge on Feb. 16. Their first game will be against Bradley, followed by UConn and Minnesota. The Panthers have won the last four out of six games in the annual Atlanta Challenge, and hope for another clean sweep after winning all three games last season. With 13 seniors on this year’s team, they possess the experience vital for a winning recipe that head coach Greg Frady and the Panthers need to not only win a Sun Belt Conference championship, but to also make an appearance in the NCAA Division I tournament. Unlike last year, the Panthers look to have a season full of healthy players ahead of them and finally have their transfers available after sitting out a year. NCAA rules require players to sit out a full season before becoming eligible to play. The Panthers have a lot to look forward to when also considering how much experience they have with the young, healthy underclassmen on the team. One of the goals for every Panther is to have a career year. Frady has reiterated time after time that he wants the best for his players, especially his seniors who are possibly in their last season as a collegiate player. After seeing players like Bryce Conley and Joey Roach get drafted into the MLB, Frady would also love to see some of his players take that next step in their careers when it comes to baseball. He also mentioned that he wants his players to be academically great and well prepared for life after college. “I think that is something that we should all dream about, but the reality is take care of your daily business,” Frady said. Frady wants the players to commit to “keeping everything in balance” in their lives and finish their degree. Frady also expressed how important it was to have a team full of seniors that the freshmen can look up to. He mentioned how it’s huge to have them on this team and wants them to be recognized as one of the best senior classes in the Sun Belt’s East Division. “If the senior class is not strong, then you need to have some major league prospects on your team because talent can overcome that,” said Frady, who believes the seniors create a great atmosphere for the rest of the team. One of those seniors who continues to generate a great environment in order for the younger players to develop is infielder Will Kilgore. 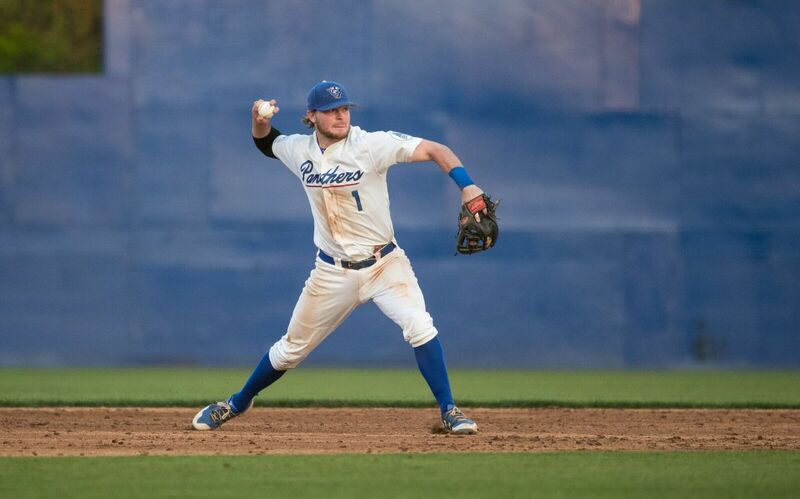 Kilgore has started two years at second base since playing at Georgia State in 2015. He has a batting average of .261 for his career along with nine home runs and 42 RBIs. Kilgore is excited about the practices that have been going on, but is ready to start the season and get things going. “The games are where everybody comes out and they love it so I’m pretty excited and I think we have a good team,” Kilgore said. He’ll gear up for his 93rd game on opening day. Kilgore is excited for the Atlanta Challenge and brought up one particular Atlanta Challenge game during his second year at Georgia State against Western Michigan, where they went to 12 innings to win a close 3-2 game. “It is an exciting atmosphere and we obviously do not want to go to extra innings, but the first game always brings something exciting like that and I am looking forward to it,” said Kilgore. Considering them good friends and teammates, Kilgore played with MLB draft picks Roach, who was a senior in Kilgore’s first year with Georgia State and Conley, who was a senior in Kilgore’s second year with Georgia State. “I think everyone who is playing at this level would want to play professionally, so yeah I would like to continue,” Kilgore said on his future. However, Kilgore wants nothing but the best for his team this season. He says the biggest goal for the Panthers this season is to win the Sun Belt championship. Kilgore believes the team has the depth for everyone to make 2018 a season for the ages. Another senior who adds to that depth is Jordan Lee, a right-handed pitcher who transferred from Chattahoochee Valley last season and played 14 games, including eight starts. “I think the team has been preparing really well through these first couple of weeks of practice and I think we are ready to take on the first week of the season,” said Lee. Lee was dealing with an injury on his non-throwing hand last fall, which he says prepared him for the upcoming season. Although he had to sit out for the fall, Lee believes that the injury did not slow him down and helped him prepare more for his comeback. “We have had a really good base of older guys and we built up for this group of seniors this year, so now it is time for everybody to produce and have a career year,” Lee said. Talking about his future, Lee mentioned that he would love to stay another year to help his teammates create a winning environment. The regular season kicks off Friday, Feb. 16 at 4 P.M. at the GSU Baseball Complex against Bradley. The Sun Belt Conference Championships begin on May 22. Georgia State looks to close out more games on the road this year and have a winning Sun Belt record. Last season, they posted a 6-17 record on the road and a 10-20 record in conference.